Beginning of December was the last competitive outing until January for Chico and Felix and a chance to qualify for the next round of the Dengie Intermediate Dressage. For once the weather wasn’t too bad and there was no sign of the low flying geese that had upset Chico on his previous visit here!! Chico did his test first, he always has to go first, he is far too inpatient to wait around and his constant whinnying and crashing about in the box is enough to drive me mad!! Felix on the other hand is far too cool to be distracted by his friends antics so having Chico go first is more for my sanity than anything else. 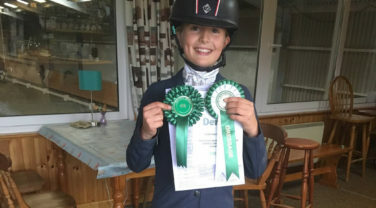 He performed a nice test considering he probably isn’t quite ready for Intermediate level just yet and Maisie was very pleased with him. Felix also did a very nice test and enjoyed showing off his recently learned medium trot! Having watched some of the other tests I was unsure as to whether either Chico or Felix would be placed sufficiently high enough to qualify. Their tests are quite different, Felix is very obedient and accurate and will do a very safe test, Chico on the other hand is far more flamboyant and expressive in his movement and although it can look very flashy he isn’t quite as reliable and safe as Felix, but hopefully this will improve as he matures. We were very happy to see that both ponies got placed with Felix 2nd and Chico 3rd so both now qualified for the next round, the Area finals! Now the hard work begins!! So, what is life like on our yard with a pony obsessed 11-year-old?? 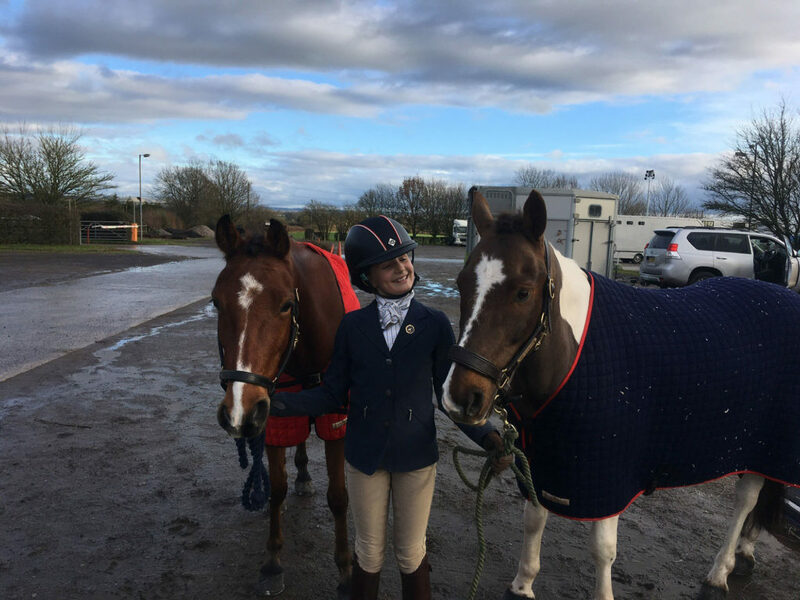 Maisie is very fortunate to have parents who both share her passion, I have 2 horses, Cougar, a retired show jumper enjoying a slightly easier life and Jonny, my hunter/dressage diva cob! We have also bred two WBxTB foals this year, which will hopefully be Maisie’s stars of the future. Maisie has visions of Badminton glory on Luna and Lupin!! But if she wants to reach such dizzy heights then she has to put the work in herself and she certainly isn’t put off by that. Ever since she has been able to pick up a shavings fork and broom she has always mucked out her own ponies and sweeping the yard has become her speciality!! I’ve always considered my standards of tidiness on the yard to be pretty high but Maisie takes it to a whole new level! She can spot a loose strand of hay on the yard at 50 paces and is on it quicker than Usain Bolt. I must admit I do like having a tidy swept yard but it does add a certain amount of pressure to my daily mucking out if Maisie has already been through the yard with her broom! I feel her eyes bearing into me as I cautiously push my over-filled wheelbarrow towards the muck heap or try and creep back to the stables with a full haynet praying that nothing falls off onto the immaculately swept concrete!! 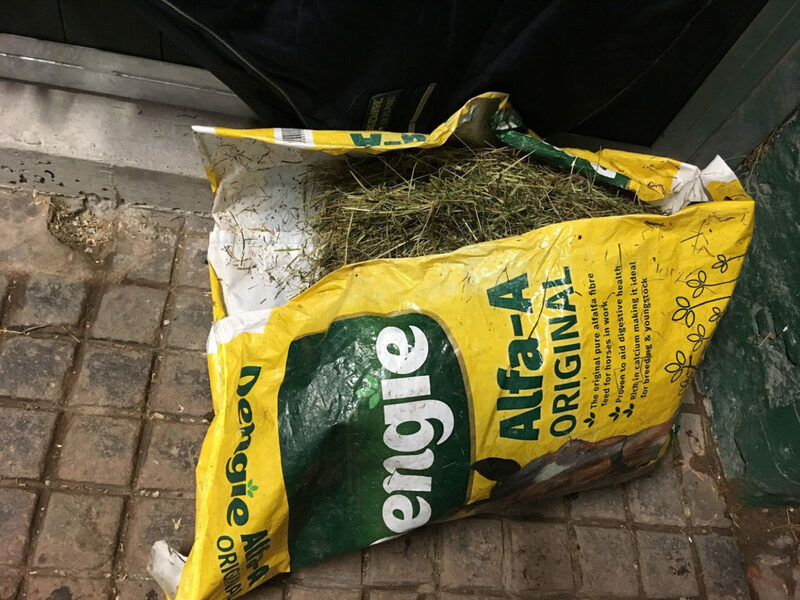 This is where empty Dengie feed sacks have been my life-saver……by simply cutting down one side of an Alfa-A bag I can easily transport several flaps of hay across the yard without spilling a single strand! Cue smug look as I proudly flounce across to my stables! However, I am still regularly reprimanded for failing to meet standards in other areas of yard life…..grooming, failing to put things away where they should be, leaving rugs on the floor etc etc…..Maisie has got her work cut out!! So although December was a quiet month for competing, the ponies have been doing plenty of schooling, especially Chico and this is really starting to pay off now. Chico has been going through a bit of a teenage phase and being a rebel but hopefully now he is starting to come through this and realises that life is much more fun when he joins in with Maisie rather than fights against her. Felix finished off the Xmas holidays with a 2nd place and qualification for the Dengie Debut 80 Area final. 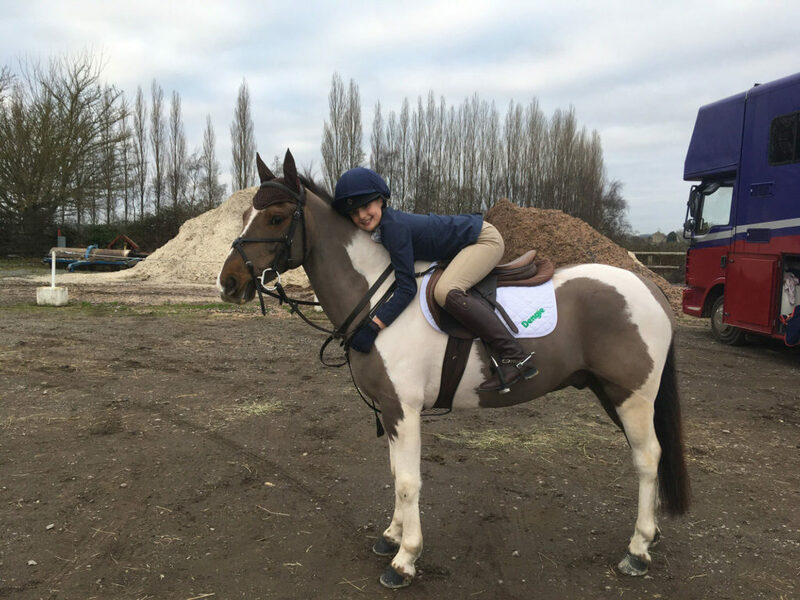 ‘Fantastic Mr Fee’ has now qualified at 80 and 90 show jumping and Novice and Intermediate Dressage – the Area finals in March are going to be very nerve wracking for this groom!! My aim for October was to try and qualify both ponies for the Area finals of the Pony Club Dengie Winter League Novice Dressage. The first qualifier was at West Wilts Equestrian Centre and it was a very wet and cold day.